Tourism in lower Manhattan has steadily grown since the terrorist attacks, but along with the welcomed economic influx comes the burden of crowded streets and a lack of facilities. Lower Manhattan has blossomed from tragedy into tourist magnet in the years since the Sept. 11 terrorist attacks, a revival that’s generating some growing pains along with celebration. For local residents and businesses, the throngs of visitors have brought an economic boon and new energy to their stricken neighborhood, community groups told City Council members at a committee hearing Friday. But there also have been downsides: crowded sidewalks, overflowing trash cans and local businesses being pressed into service as public bathrooms. Lower Manhattan has tripled the number of hotel rooms available since 2001. Photo by Rebecca Wilson. City officials say they’re working to iron out the problems, for the sake of tourists as well as residents. “We want to give the visitor a good experience,” said City Councilwoman Margaret Chin, who convened Friday’s hearing. In the early years after the 2001 attacks, it was difficult to envision crowds becoming a problem in lower Manhattan, which officials define as a one-mile-square area that includes Tribeca, the financial district, Battery Park City and some other neighborhoods south of Canal Street. Many businesses shunned the area; hundreds, if not thousands, of residents moved away. But lower Manhattan now has three times as many residents as it did before the attacks; there also are slightly more businesses, officials say. Not to mention the 9.8 million tourists who visited the area last year, up 30 percent in two years, according to the local business improvement district, called the Downtown Alliance. 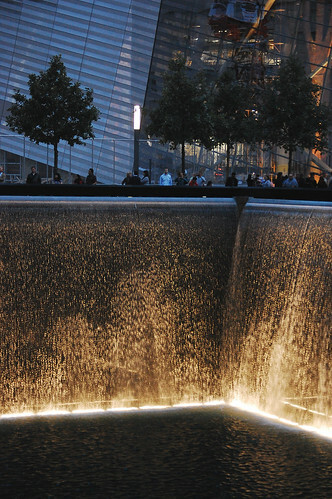 The growth partly reflects people flocking to the Sept. 11 memorial, which has drawn about 4.5 million visitors since it opened in September 2011. There are three times as many lower Manhattan hotel rooms as before 9/11, the alliance says, and tourists make up a growing share of the guests in hotels that traditionally catered to business travelers. The city’s tourism arm, NYC & Co., estimates that international visitors spent $1 billion in lower Manhattan last year, a calculation derived from government surveys and other data. The influx of residents and tourists — and, at times, Occupy Wall Street protesters, who camped in lower Manhattan’s Zuccotti Park last year — has come in an area rife with narrow streets and construction zones: 69 of them at the moment, according to Catherine McVay Hughes, chairwoman of the local community board. Getting around can entail navigating sidewalks congested with scaffolding, picture-taking tourists, teeming litter baskets and piles of trash from apartment and office buildings. And getting to a public restroom can be tricky; the Sept. 11 memorial plaza doesn’t have any, though bathrooms are planned in the accompanying museum, now under construction. While residents realize the benefits of tourism, “it’s something that needs to be dealt with,” McVay Hughes said. She presented the council’s Lower Manhattan Redevelopment Committee with a to-do list that ranged from building bathrooms to increasing trash pickups to cracking down on tour buses that park where they’re not allowed. The city already has taken some steps, such as adding more garbage cans in the area since August, said Jeff Mandel, a City Hall economic development policy advisor. Other moves include keeping the memorial visitors’ line from crowding the sidewalk and encouraging memorial visitors to take mass transit instead of private tour buses, he said.